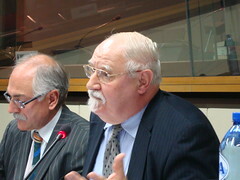 In his concluding remarks to the 7th Brussels Development Briefing on food prices, Professor Eric Tollens from the Catholic University of Leuven underlined that this crisis is an urgent wake-up call. Agricultural supply has been proven to have a low price elasticity; in other words the huge price increases only led to a low increase in production. 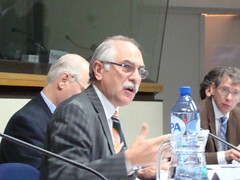 Governments must play a major role now to stimulate agricultural production, to profit from the opportunity. Most developing country governments only spend around 4% of their budget on agriculture, and many, such as Congo, only around 1%. Nevertheless, 10% of the total budget is an absolute precondition to really develop the agricultural sector, as Malawi is doing. Agriculture is the backbone of most developing economies, and it is essential that they stop being net importers of food. Representing FAO, Luca Alinovi stressed that the high food prices are really just a symptom of the structural problem facing millions of undernourished people. One the one hand, industrial countries have to wonder how committed they are, most still do not spend the promised 0,7% of their GDP on development aid. On the other hand, developing countries have to ask themselves if they really believe in agriculture, since they invest such small percentages of their budget to it. He argued that the well-known pair of opposites – free market versus protectionism – do not properly describe the situation. The solution lies in between: protective measures sometimes have adverse effects on an economy, sometimes liberalization is the wrong decision. From his side, instead of summarizing the main points of the 7th Development Briefing, CTA director Dr. Hansjörg Neun raised some points which were not discussed. First, he saw a huge potential in irrigation to extend the potential of largely rainfed agriculture in many developing countries. Second, since post-harvest losses can be substantial, an effective strategy to increase food security should also encourage crop storage at the farm level. Third, diversifying the crop supply could be a promising strategy: we currently depend on only five staple crops out of hundred of thousands. Finally, Dr Neun returned to technology. It may not always be the best solution for small-scale farmers, they could perhaps rather look into composting or bio-gas and other techniques not requiring high external inputs that are often themselves affected by rising prices.